I've been a baaaaad blogger. I know. I've been missing for about two weeks, but I didn't know that would happen, so it was totally unintentional. I've just had a flurry of things keeping me busy recently - work (kind of a necessity), party planning and packing. And no, the party's not for me. It's for my mom. And nope again, I'm not going anywhere exotic or fantastic this year. *sad face* But I am moving in a couple months, and I have to break down my current home where I've been living (and semi-hoarding) for over nine years. Ok, so I've got a bit more than "essence" going on here... 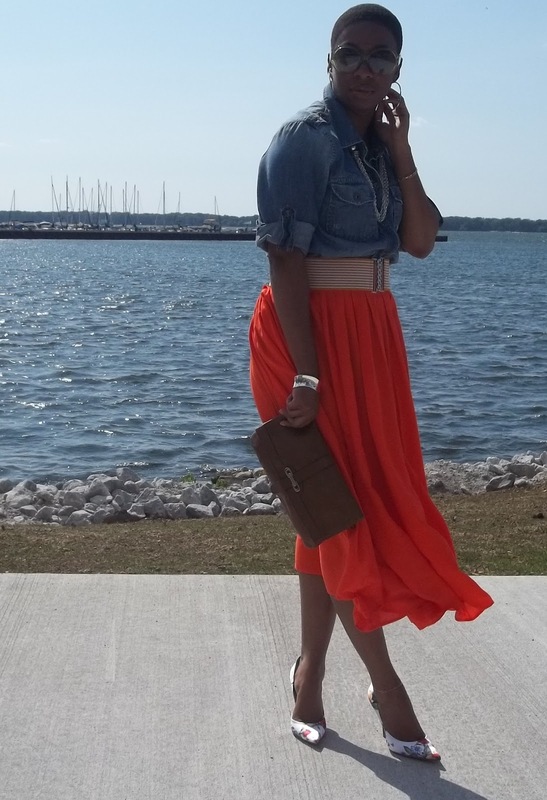 I rocked a bright n' loud-see me-I'm-right-here orange skirt and loved every bit of it. It was flowy and flouncy and blew softly in the breeze when I walked. All that stuff that makes it fun to be a girl! Because of the midi length and the soft shape of the skirt, I ordered two, this one and another in bright pink. The length was exactly what I wanted, but I'm going to have to get the waist altered just a little bit, I'd like it to fit just a tad more snug if I'm not wearing a belt (sounds like a job for mom). I've talked before about my buying multiples of things. I feel a teeny twinge of guilt when I have to admit it out loud. It doesn't necessarily always happen in a single purchase, sometimes it's over time. Like these pumps, which I love and don't get to wear as often as I'd like. They are the epitome of a sunny day shoe, but I also have them in two other prints (my personal fav found here). I actually had four different styles of this pump, but I wore the basic black leather until I had to send it away to well worn shoe heaven. They were the perfect pump, so I was totally distraught about it. I hope all you divas had a fabulous holiday and are all relaxed and ready to start off a new work week! Happy Monday!